BoyRaket.com: LAZADA IS CELEBRATING 9.9 AND ASUS PHILIPPINES JOIN IN ON THE FUN! 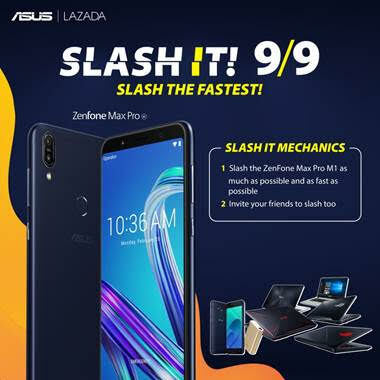 Be ready to SLASH IT as ASUS Philippines teams up with Lazada Philippines on September 9! Also get the chance to purchase the ZenFone Max Pro at a very special price from the official ASUS Philippines Lazada store just by slashing the product the fastest and by inviting others to play. Not only that, other incredible products from ASUS will be placed on FLASH SALE as well! Crowned as the Battery King for Limitless Gaming, the ZenFone Max Pro packs a 5,000 mAh battery capacity. Coupled with the all-powerful Qualcomm™ Snapdragon™636 and an Adreno 509 GPU, mobile gaming has never been as smooth and long-lasting. The ZenFone Max Pro on Lazada will be available with a3GB memory and 32GB internal storage. Slash this ZenFone quick enough to get it for just PHP 7,999.00. The ZenFone Max Pro will also be available during the Flash Sale for PHP 8,995.00. Charge gadgets on the go with the stylish, lightweight, and powerful ZenPower 10050 mAh! Slash this ZenPower as fast as you can to purchase for just PHP 749.00. With the ZenFone 4 Selfie Lite, taking selfies has never been easier. Enjoy amazing and vivid selfies with friends and family through its 13MP front-facing camera, as well as a hassle-free performance with its strongest variant yet, a 3GB memory with 32GB internal storage. Get this special smartphone for just PHP 6,295.00 during the Flash Sale. Catch the moment in full detail with the ZenFone 3 Zoom. Its 12MP rear shooter can cater up to 12x the view; especially with its incredible digital-zoom technology. Without a doubt, no one can ever miss a thing. Get this special smartphone for just PHP 10,995.00 during the Flash Sale. Through the ZenFone 3 Laser’s 13MP main shooter, users of this special ZenFone are sure to enjoy one of the best photography experiences a ZenFone smartphone can offer. Get this special smartphone for just PHP 6,495.00 during the Flash Sale. VivoBook X407/X507 is a premium entry level laptop that is perfect for productivity and entertainment. There won’t be any difficulties in bringing this notebook anywhere because it is a portable laptop with 1.68kg for the X507 and 1.42kg for X407 weight. This notebook is powered by 7th Generation Intel Core i7 Processoralong with NVIDIA GeForce MX110 Discrete Graphics, and a NanoEdge Display forw a full-frame view perfect for school or work presentation. VivoBook X407/X507 also features a fingerprint sensor on the touchpad with Windows Hello. Get this on the 9.9 for only PHP 17,995.00. VivoBook X556UQ offers a classic and expressive color designs with uncompromised performance powered by7th-generation Intel Core i7 Processor along with NVIDIA GeForce 940M graphics to give it the power to tackle graphically-demanding tasks with ease. These notebooks also provide rich detailed images on screen, courtesy of the ASUS Splendid Technology. On 9.9, this amazing VivoBook can be yours for just PHP 37,995.00. Designed for both first-person shooter (FPS) and multiplayer online battle arena (MOBA), these powerful successors feature a more compact design and a new front RGB light bar with customizable Aura Sync lighting. Both the SCAR II and Hero II laptops feature the world’s first 144Hz ultra-narrow-bezel display which allow for hyper-immersive visual performance. Both editions come with an 8th Generation Intel Core i7-8750H processor and 16GB of DDR4-2666MHz RAM. The Strix GL504 SCAR II comes with a 256GB NVMe PCIe SSD, a 2.5” Firecuda 1TB SSHD, NVIDIA GTX 1070 with 8GB GDDR5 VRAM; while the Strix GL504 Hero II comes with a 128GB NVMe PCIe SSD, a 2.5” Firecuda 1TB SSHD, NVIDIA GTX 1060 with 6GB GDDR5 VRAM. Get these powerful laptops at the below special prices during the Lazada 9.9 Flash Sale. The very first TUF gaming laptop comes with the spirit of The Ultimate Force (TUF) and is designed to strike fear into the heart of the enemy. This portable, powerful and enduring all-rounder is able to play the latest games and can multi-task with ease, and at the same time, providing unmatched toughness and durability which gives an uncompromising gaming experience. FX504 comes with an 8th Generation Intel Core i7-8750H processor and 8GB of DDR4 RAM, 1TB SSHD, NVIDIA GTX1050Ti with 4GB VRAM. You can have these all-arounder during Lazada 9.9 Flash Sale. September really is a month to remember! Be sure to tune in to Lazada Philippines and ASUS Philippines for an amazing September 9th!